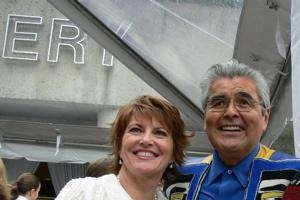 Bubbling over with enthusiasm at the expected smash success of the Monet to Dali exhibit, director of the Vancouver Art Gallery, Kathleen Bartels, and Haida artist, Robert Davidson sparkle at the champagne reception. Robson Square set the stage for an evening of the lavish outdoor reception launching the Vancouver Art Gallery's premier fundraising event, the Monet to Dali Ball on June 8. The music of Ravel and Debussy played by a classical string quartet created the perfect ambiance while guests were sipping champagne amidst floral artist Hitomi Gilliam’s artistic interpretation of Claude Monet's garden at Giverny. Touted as the most significant showing of European art in the history of Vancouver, guests of the Monet to Dali Ball were the first to sneak a peek at the highly anticipated exhibit, Monet to Dali: Modern Masters from the Clevland Museum of Art, opening Monday, June 11 until September 16, 2007—sans the anticipated line ups.